Deirdre was an overzealous Inquisitor for the Church of Light in the Holy Griffin Empire. She spent many years hunting Demon cultists in the Free Cities of the East on the fringe of the Empire's territory, "cleansing" innocents and culprits alike, worried that a lapse of her vigilance would allow the corruption to spread. In the end, when she was captured and tortured to death by her enemies, her restless soul was spirited away by Necromancers who coveted her knowledge. Now converted to the Necromancer's cause, it can be argued that no being, living or unliving, knows more about screams than Deirdre. Unique Necromancer's skill. Allows a Necromancer to raise 20% of fallen enemy living creatures as own soldiers (A limited number of creatures can be raised per week). Influences the number of dark energy points. Grants a hero an ability to call upon death itself in combat. All enemy living creatures receive -1 to morale, luck and -10% on initiative. Reanimates creatures in target friendly stack. 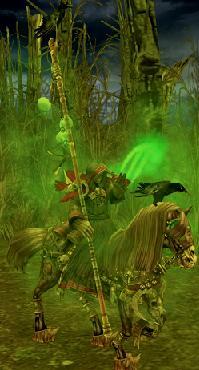 Undead creatures are brought back to "life", all other creatures are re-animated for the duration of the battle only. Every use of this spell decreases hit points of target stack by 20%. Giovanni was once a minor count of the Bull Duchy, but too far removed from the ruling line to hope for a position of importance. He ended up seeking power in a different way, following his sister Lucretia into the arts of the Necromancers. Now a powerful Vampire Lord, Giovanni controls an important region on the border with the Griffin Empire. Every time a group of enemy creatures dies it is replaced by a group of friendly Ghosts for the time of combat. The number of Ghosts depends on hero's level. The First Aid Tent will heal 5 more hit points per hero level. The damage in case of Plague Tent ability is also increased. Kaspar starts with a First Aid Tent. All Vampires and Vampire Lords in hero's army gain +1 to their attack and defense for every two levels of the hero, starting on first level. A devoted student of all that Necromancy can offer, Markal has risen to the highest heights that one can achieve among the Necromancers -- while still being alive. Formerly the court astrologer and favorite counselor of the Griffin Queen Fiona, Markal established a strong (but secret) base of Death cultists within the Holy Empire. The religious leaders of the Church of the Light became suspicious of his nefarious activities, however, and when Fiona passed away her advisor was exiled.Realizing that he will no longer circulate freely among the other kingdoms of Ashan once he receives the Kiss of the Spider Goddess, Markal furthers the goals of Heresh through diplomacy and, of course, skullduggery. All neutral undead creatures will join hero's army. The number joining army is 50% of initial number + 2% per hero level. Naadir despises the world of flesh, even more so than his fellow Necromancers. To him, perfection is only to be found in the naked spirit, cleansed from its material impurities. On the battlefield, his intimate knowledge of the spirit world allows him to "capture" the souls of his enemies and use them as reinforcements to his own forces. The Raise Dead spell has increased effect. The spellpower of this spell is increased by 1 for every five levels of hero, starting on first level. All Zombies and Plague Zombies in hero's army gain +1 to their attack and defense for every two levels of the hero, starting on first level. The Curse of Weakness spell not only lowers creature's damage, but also reduces creature's defense by 1 for every three levels of hero, starting on first level. Zoltan is one of the many Undead leaders who views mages as their true enemies. To better know them, Zoltan studied deeply in the arcane magics of the Silver Cities. As a result, he can combine his own Necromantic skills with arcane ones to a particular effect : once a spell is used by an enemy that knowledge "dies" as long as Zoltan is on the battlefield. If enemy hero casts any spell, it can be blocked in his or her spellbook making it impossible to cast that spell again in this combat. The probability of blocking increases as hero gains new levels. The higher the spell's circle, the harder it is to block it.